Living to work or working to live? 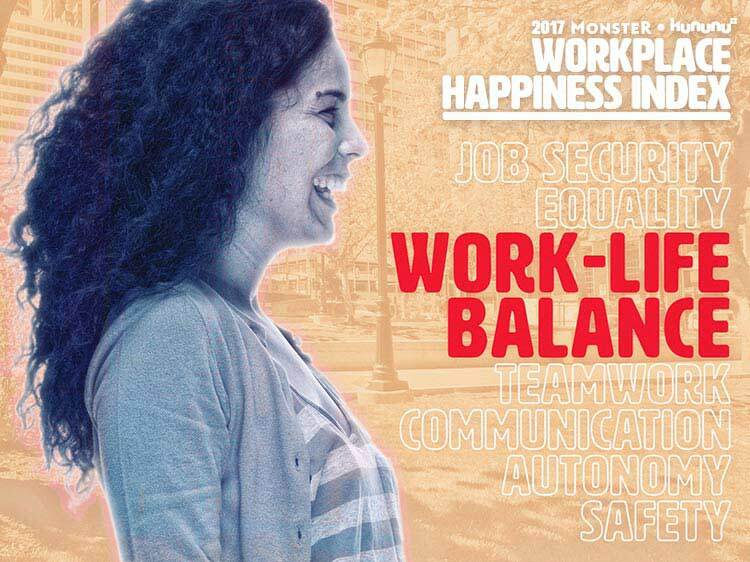 Our exclusive Monster•kununu Workplace Happiness Index ranks U.S. companies with the best work-life balance, so you can do what you love and love what you do. When you left the house this morning, it was dark outside. Now, as you sit at your desk the sky has become the same navy color it was on your early morning commute. You feel your back crack from sitting at your desk for too many hours at a time. Your stomach grumbles, long past ready for dinner, as the lunch you scarfed down at your desk was less than satisfying. You can’t even remember the last time you made weeknight plans or didn’t have work to do over the weekend. Now, imagine having a job that didn’t dominate every aspect of your life. A job that would allow you to meet up with your friends for happy hour after work or spend your Sundays watching the game rather than catching up on paperwork. This may sound too good to be true, but it’s definitely what you’re looking for. In a recent poll, Monster asked our users to rank the most important workplace factors, aside from salary. The results showed that the majority of you are looking for good work-life balance, with 40% saying it’s the most important workplace factor. We decided to expand on this data, and teamed up with our partners at employer-review site kununu to create the first ever Monster•kununu Workplace Happiness Index. Using kununu’s 18 key dimensions of workplace satisfaction, we identified the companies with the highest overall level of work-life balance. Then, through an exclusive Monster analysis of data from the TalentNeuron tool from insights and technology company CEB we culled job market analysis on hiring history at these companies, and matched it with job listings on Monster. The winners are a unique mix ranging from retail companies to and airline. But don’t just take our word for it that these are great companies to work for. Take it from the people who know the best: current and former employees who left reviews on kununu’s site. See if you too might be able to find work-life balance at one of the companies below. What they do: Run by the “Oracle of Omaha,” Warren Buffett, Berkshire Hathaway serves as a holding company for a multitude of businesses, including Fruit of the Loom, Kraft Heinz, and the residential real estate broker HomeServices of America. Why they’re on the list: Reviewers say that “being an employee of one of the most respected companies in the world,” you get to work with a “fun group, great leader, diverse co-workers” who are “flexible” and “caring.” With an office environment like that, work doesn’t always have to feel like work at Berkshire Hathaway. Find jobs at Berkshire Hathaway on Monster. What they do: Johnson & Johnson is a manufacturer of medical devices, pharmaceuticals, and consumer packaged goods that operates about 250 subsidiary companies. Why they’re on the list: “An amazing place” to work, reviewers say that Johnson & Johnson is “very flexible and encourages employees to balance life and work.” As far as your co-workers go, the ones here can be described as “very friendly, extremely smart, and very knowledgeable” —you know, the kind you might actually see yourself hanging out with outside of working hours. Find all jobs at Johnson & Johnson on Monster. What they do: Chevron is a multinational energy corporation, engaged in every aspect of the oil, natural gas, and geothermal industries. Why they’re on the list: Reviewers say that Chevron boasts “excellent work-life balance.” Taking a look at the benefits offered at Chevron, employees are given paid time off, access to counseling services, and compressed workweek schedules and flextime options. The company even offers programs to help balance your work and personal schedule. Find jobs at Chevron on Monster. What they do: TJX is an international fashion and home décor retail conglomerate, which owns the Marshalls, HomeGoods, T.J. Maxx, and Sierra Trading Post brands. Find jobs at TJX Companies on Monster. What they do: H&R Block is a tax preparation company that additionally offers payroll and business consulting services. Find jobs at H&R Block on Monster. What they do: Delta is the second largest U.S. airline. Find jobs at Delta Airlines on Monster. What they do: In-N-Out Burger is a popular fast food hamburger chain that operates in six states. Why they’re on the list: Reviewers say the burger joint is a great gig for students or people juggling busy lives because “they work around your schedule, no matter what happens” —a rare thing to find in the restaurant biz (unless that’s how you like your burger cooked, of course). Find jobs at In-N-Out Burger on Monster. What they do: Chick-fil-A is a popular fast food chain, with more than 2,100 restaurants nationwide. Why they’re on the list: As a consumer, you might hate not being able to satisfy your Sunday Chick-fil-A cravings, but as an employee, Sunday is a guaranteed day off. It’s a tradeoff the fast food chain is happy to make. Chick-fil-A believes that “Sundays are meant for getting out and spending time with family and friends,” according to its website. Find jobs at Chick-fil-A on Monster. The Monster•kununu Workplace Happiness Index includes industry data provided by kununu from August 2016 to July 2017. Reviews on kununu are broken down into 18 key dimensions of workplace satisfaction with each dimension assigned a star rating. The above information takes into account the average of those ratings over a 12-month period. Only companies with a minimum of 15 reviews were considered.